Beginning with the pioneering experiments conducted in 1913 and 1914, powder xray diffraction has been an important tool for studying minerals. Likewise, following the initial neutron and synchrotron X-ray diffraction experiments in the 1930's and 1960's, respectively, these methods also were quickly applied to the study of minerals. Today powder diffraction is a standard technique in many laboratories that is capable of providing a wealth of information in areas such as phase identification, crystal structure analyses, quantitative analyses, particle size and strain measurements, etc. In the last decade, several developments, including the increased availability of high-intensity, highresolution neutron and synchrotron X-ray sources, have sparked a Renaissance in the field of powder diffraction. Perhaps the most significant changes, however, have occurred in the area of the standard laboratory X-ray powder diffractometer. Whereas until recently this instrument was a stand-alone device, typically providing data in the form of a stripchart recording, new diffractometers are automated and interfaced to computers powerful enough to analyze data quickly and easily. Simultaneously, because of the availability of more powerful computers and of digital diffraction data, numerous advances were made and are continuing to be made in the analysis of data, including Rietveld refinement of crystal structures, profile fitting, and modeling of the diffraction patterns obtained from complex disordered structures such as the clay minerals. In this Reviews in Mineralogy volume, we have attempted to: (1) provide examples illustrating the state-of-the-art in powder diffraction, with emphasis on applications to geological materials; (2) describe how to obtain high-quality powder diffraction data; and (3) show how to extract maximum information from available data. We have not included detailed discussions of certain specialized techniques, such as texture analysis or diffraction experiments under nonambient conditions, for example high-temperatures and high-pressures. In particular, the nonambient experiments are examples of some of the new and exciting areas of study using powder diffraction, and the interested reader is directed to the rapidly growing number of published papers on these subjects. Powder diffraction has evolved to a point where considerable information can be obtained from ug-sized samples, where detection limits are in the hundreds of ppm range, and where useful data can be obtained in milliseconds to microseconds. We hope that the information in this volume will increase the reader's access to the considerable amount of information contained in typical diffraction data. 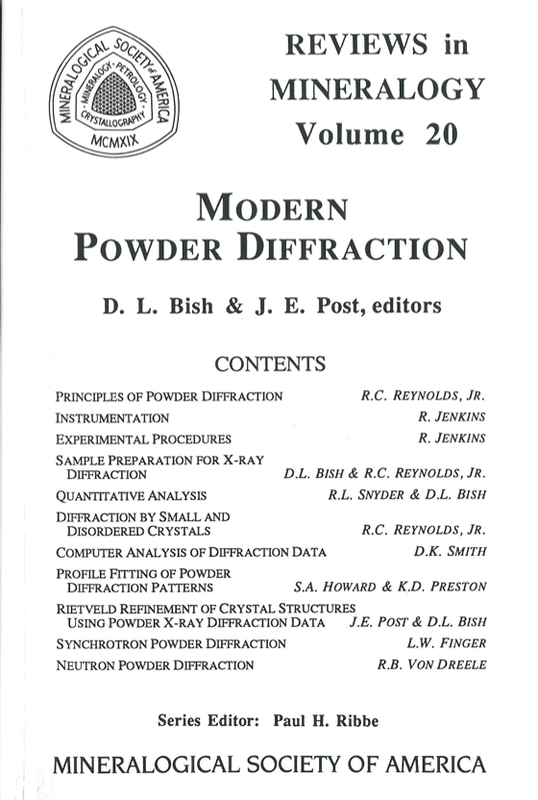 David Bish and Jeffrey Post, the editors of this volume, convened a short course on advanced methods in powder diffractometry November 4 and 5, 1989, in conjunction with the annual meetings of the Mineralogical Society of America (MSA) and the Geological Society of America in St. Louis.